A single entry blog about Bill, R.Jay, Tom, and Spence's adventure to Las Vegas to watch the Mountain West Conference basketball tournament. In Pocatello, the municipal courses are under contract to open by March 1st each year. While the courses may be open, rarely is anyone out golfing. That early in the year in southeastern Idaho generally means someone will be sitting in the pro shop selling season passes to patrons anxious to have the lingering snow melt. Most residents of Idaho can get through November and December without golf since the holidays dominate people�s thoughts; but by early March, golfers are tired of the cold winter with little daylight and are anxious to get back out on the links. At this same time the greatest month of college sports hits � March Madness! Nothing could be better than combining golf with some NCAA tournament action and that is exactly what we did this spring. Back in January, Spencer Ellis fired off an email to me, R.Jay, and Tom (see About Us section for bios). The proposal was a weekend in Las Vegas to watch the Mountain West Conference basketball tournament (we�re big BYU fans), play some golf, and eat some buffets. It took me about 0.07 seconds to hit �reply� on my email server to say, �I�m in!� Within minutes everyone had responded to the email and plans were made for a great �guys� trip. R.Jay showed up at my house at 5:40 AM with his Yukon full of gas and ready to roll down the road. We picked up Tom and headed to Provo where we would pick up Spencer and his luggage. The entire time we�re cruising down I-15 I�m keeping an eye on the temperature readout display found on the rear view mirror. When we left Pocatello it was in the 20s; in Provo we broke 30; and most of the way to St. George it is sitting around 35 degrees and snow is visible from every window. Like every trip down south, we are doubting ourselves and the weatherman by the time we hit Cedar City; less than an hour from our 2:00 tee time at Sand Hollow outside St. George. One thing you have to realize though is that Cedar City sits 2500 � 3000 feet in elevation higher than the St. George area golf courses do. In the final 30 minutes into St. George we�re watching the temperatures rise as Nikki (GPS system) shows the elevation free falling. We arrive with enough time to sit down and eat before our round of golf; a rarity on our golf trips for sure. On the road we almost always elect to eat somewhere that we can�t at home and when Tom spots the In-N-Out Burger sign we knew our lunch destination had been discovered. Apparently though, half of St. George had the same idea as the drive-thru line was 10 cars deep and the line inside the restaurant featured two dozen people waiting for their food or waiting in line to order. Fortunately there isn�t a lot of decision making to be made when you are staring at an In-N-Out Burger menu. You can order a hamburger with or without cheese, or you can order a double cheese burger. Beyond that your only side item option is an order of French fries, which comes in only one size, and then you have the option of a drink and/or milkshake. I decide to order the double cheeseburger and tell them I want it �animal style� since that is what Daren told me to do the first time we ate an In-N-Out in California a couple years ago. I still am not sure what the means, but my cashier seems to and I�m given a receipt and told to wait. About 10 minutes later we all have our food and feel satisfied enough to head over to Sand Hollow for some golf. R.Jay and Tom haven�t played since we got together in Park City in October to play the new Victory Ranch course prior to attending the BYU vs TCU football game while Spence and I had each been in Arizona working off some rust in February. We give ourselves enough time to hit the driving range prior to our tee time. What we didn�t realize is that Sand Hollow issues tee times every eight minutes and by 2:00 they are backed up over a half hour � a frustrating situation when you have limited daylight. In October, Tom and I took on R.Jay and Spencer in a two-man best ball match play competition and finished all square after our 18 holes at Victory Ranch. We decided to continue the competition at Sand Hollow just before putting our pegs in the ground and letting our tee shots fly. The front nine moves slowly but we love the fact that we are in nearly 60 degree weather golfing rather than in our offices staring at snow. The pace has been slow enough that we�ve had more than one opportunity to chat with the foursome behind us. They find out that we are big BYU fans and we discover that one is a Utah Ute fan. He tells us that his brother lives in Pocatello and tells us his name is Dan Snell. Dan Snell! You�ve got to be kidding! Dan lives within a couple of blocks of me, R.Jay, and Tom and is also the biggest Utah Ute fan (and BYU hater) that I�ve ever met. We have a good laugh about how small the world can be and get back to some golf. It�s a close battle with Tom and I trailing for most of the match, but as the sun set and everyone else was off the course, Tom and I are fighting back in an effort to extend the match. In the complete dark, everyone someone finds their tee shots and my par on the 18th hole is enough to win the hole and bring the match back to all square after 36 holes. It�s time for dinner and we are calling all over St. George trying to find somewhere that has The Mountain TV channel so that we can watch BYU�s opening MWC game against TCU who they hung over 100 points on the week before. R.Jay has a $25 gift card to Red Robin that he is willing to donate to our dinners, but once we discover they don�t have the channel it is dismissed as an option and we go on the prowl to find a quality sports bar. Spence pulls up Iggy�s on the GPS feature on his cell phone and we anxiously follow his directions . . . to a car dealership. Something is wrong. There isn�t an Iggy�s anywhere is sight. Fortunately, Mike and I had discovered another sports bar on a previous trip named Player�s and we were off to the races. We roll into the restaurant just before halftime and discover that TCU is shooting the lights out and that the game is much closer than anyone predicted. We order our high-calorie, low-nutritional value food and watch the second half. BYU rolls along much better in the final 20 minutes of the game and we�re able to eat our sweet potato fries and sandwiches with a much lower stress level than originally thought. The next day we dive into our first buffet of the trip; a breakfast feast at the Marriot. We eat as much waffles, omelets, oatmeal, fruit, and cereal as we can since we know our next meal won�t be until nearly dark. We take off for Las Vegas with a quick side trip over to Wolf Creek in Mesquite to show Tom and Spence the �fantasy� course that is so amazing it�s tough to believe anyone showed up at the property and thought, �This is where we need to build a golf course.� We leave some drool on the grass and load up and head for the Badlands. The Badlands is a 27 hole Johnny Miller/Chi Chi Rodriguez designed course that opened up their original 18 holes in 1995 (Desperado and Diablo) with the newest nine holes (Outlaw) joining the grouping in 1997. 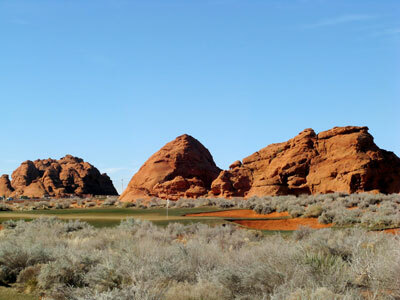 The Badlands is a true desert experience; miss the fairway and venture out into the desert looking for your ball. We played Diablo and Desperado and continued our match. 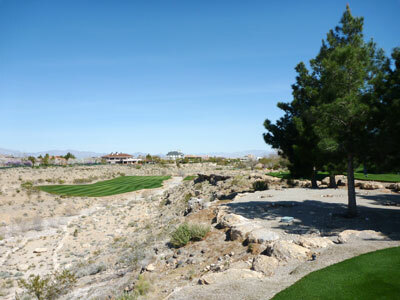 The courses aren�t super long by today�s standards yet offer a challenging layout with a desert wash coming into play multiple times throughout the round. Both nines offer a unique combination of elevation change, desert, and variety and is the kind of course you�d like to go back and play immediately again having gaining some �local� knowledge the first time around. The course was in great shape and was a real treat to play. Unlike the previous day, Tom and I held the lead for the majority of the day, but somehow Spence and R.Jay battled back and tied it on the 18th hole for force yet another extension of the match. With little daylight left, it is time to belly up to another buffet before attending the Mountain West Conference basketball tournament in the Thomas and Mack Center located not too far from the famous strip. Before heading for the buffet, Spence gets us checked into the hotel so that he can pick up his second shower of the day; a trend he carried on for the course of the trip. After reading some reviews online, we settle in on the buffet found at the Mirage which features cuisine from virtually every nationality one could hope for. We are led to our seats and instantly grab plates and head for the precut crab legs, which unfortunately were cold. By the time we were done eating we had put a serious dent in the crab legs, shrimp, prime rib, bbq ribs, and salad bar. Salad bar? Yeah, I admittedly am a huge salad bar fan and the Mirage features a great offering where you select the items you want and then a chef tosses the ingredients and dressing together for a bowl of salad bliss. I liked it so much that I skipped the dessert bar and took a second bowl of salad. After leaving a stingy tip, it was time to head off to the game. We arrived at the Thomas and Mack Center and started scoping the parking situation. As we are sitting in line we spot a perfect place to park the Yukon, however it is just beyond our grasp in a roped off section. Undeterred, Tom jumps out in an effort to �alter� the rope in a fashion that would allow us to slide into the parking space. While we sitting there observing Tom�s handy work, we hear someone yell, �Hey!� from the distance. We look around and find a parking attendant that isn�t happy about our re-roping efforts and we then realize that the line we are sitting in outside the arena is for paid parking. We patiently wait our turn in line and back the Yukon into a parking space designed for a Geo Metro and run into the arena. Once inside, we find our seats in the upper bowl, behind a TV camera. The San Diego State versus New Mexico game is in full swing and the crowd is rowdy. The camera blocks the basket at one end of the arena and we instantly start scheming how to get into the lower bowl. When Tom, Mike, and I were in Denver attending the NCAA tournament we had great success waiting outside the terminals after the early game and obtaining tickets from patrons that were leaving the arena before the second game. We tried our luck at that approach again and Tom worked his magic and was able to land seven tickets in the lower bowl. We move into our seats, much more satisfied with our view, and settle in for the BYU vs UNLV game. Being in Vegas, there is obviously a lot more Rebel fans than Cougar fans in the building and the UNLV faithful made sure everyone knew it. In fact, there was a couple of times we all thought that R.Jay was going to end up getting in a fight and we were all sitting there discussing whether we �had his back� if things got crazy. In the end, we survived but BYU didn�t as they lost a close game to the home town Rebels 70-66. Completely discouraged by BYU being eliminated from the tournament, we decided to sell our tickets to the Saturday session and dedicated ourselves to golf and food. First thing Saturday morning we load up our clubs and head back to the Badlands to play the Outlaw nine and the Diablo course. Obviously BYU�s loss affected Tom and me more than our competitors since we lost every hole on the front nine which led to the end of our long standing match. The Outlaw nine was a more forgiving set of holes with wider fairways than the other nines, but it would have taken a sod farm to contain so of the wild drives I was hitting that day. 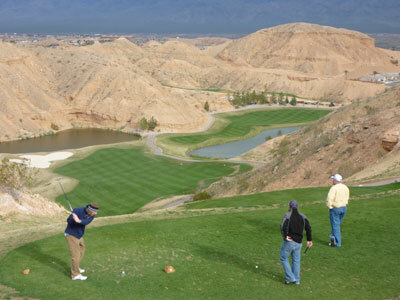 After golf we motored up the road to Mesquite where he decided to tee it up at Falcon Ridge, a course that opened in 2004. We only had time for the back nine, which is by far the more dramatic side. The winds were howling and the temperatures were dropping but it didn�t stop us from enjoying this creative layout. 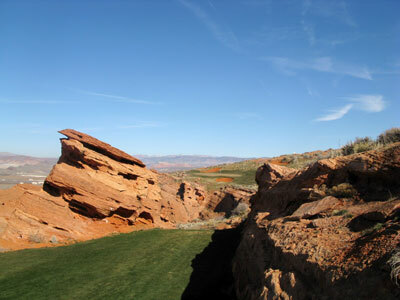 I had heard people refer to Falcon Ridge as �mini-Wolf Creek� and I can see why; tons of elevation changes, dramatic canyons, some water hazards, and a ton of challenge and fun. It�s time to wrap things up and visit yet another buffet. This time it is the Casablanca in Mesquite where we dive into more crab legs, filet mignon, crab legs, shrimp, crab legs, salad, and crab legs. We are surrounded by other groups of guys that are visiting the warmth of Nevada playing golf. You can hear guys razing each other about blown three foot putts and the shanked iron shots that emerged out of nowhere. It is the nature of golf trips of guys around the world; play golf, eat after dark when you can�t play anymore, and reminisce about what could have been but wasn�t. Golf trippin�, what could be better?